The new TV Gateway (TVG) product from ONELAN Digital Signage enables delivery of live Freeview content to your desktop PCs. Using Multicast streaming technology, up to 40 radio and TV channels can be delivered live to every desktop across your local office network. 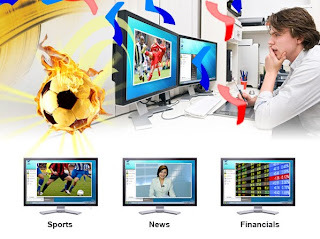 Multicast technology delivers multiple video streams to the desktop while reducing the impact on performance for existing network applications. This reduces the risk of network disruption and enables simplified deployment of the TVG on any modern network infrastructure, while happily coexisting with current business operations. The TVG provides a cost effective way of delivering multi-channel content to users in a range of scenarios including improving reception and communal areas, delivering key sporting and entertainment events to clients and customers and allowing employees to watch Freeview content in a managed environment. Digital Signage media players - such as ONELAN’s Net-Top-Box (NTB). PC desktops – playable on most modern computers, with free software available for older PC’s. Designed as a network appliance, the TVG provides all key functionality and status through its front panel, allowing PC users to view live Freeview content on their desktops within minutes of installation. The LCD front panel provides live status about bandwidth utilisation, channel availability and channels currently tuned, while more detailed configuration and status can be accessed using any modern web browser.. The TVG requires only a single TV aerial input, an Ethernet connection and power, and as such can be installed and streaming in minutes.